One of the obvious problems with memory that doesn’t really require any SQL Server monitoring tool to be detected is when the system simply doesn’t have enough random-access memory AKA RAM. In such cases, memory pressure can occur because SQL Server simply cannot allocate enough memory. Hopefully, this will be a short article rather than a long one like I did with disk I/O performance but this stuff is essential to get the complete picture and take all things into account when troubleshooting performace issues. If you’ve troubleshooted memory issue before, then you probably encountered some of the symptoms like system wide performance decrease and I/O increase. So, let’s get started with the Dynamic Management Views AKA DMVs. Most of you knows what DMVs are, but for those who doesn’t, DMVs are views and functions that return server state information which can be used to monitor the health of a server instance, diagnose problems, etc. If both flags are zero, you’re in good shape. Memory available megabytes – this is just a great all around counter especially if we track it for a long time because we can find out what thresholds are for memory. The default memory threshold value is 100 MB. SQLServer:Buffer Manager/Buffer cache hit ratio – this represents a percentage of how often SQL Server can find data pages in memory as opposed to fetching them from the disk. This number should be == > 98%. I’d say that if that ratio is less than 95% than the server is under memory pressure. We always want this to be extremely high. SQLServer:Buffer Manager/Page life expectancy – this is probably the most popular performance counter when it comes to memory in SQL Server. It represents the number of seconds a page will stay in the buffer pool without the references. If I’d have to choose one counter, this metric is the one that all SQL Server monitoring tools should be able to track. So, essentially, we want the page to stay in the buffer for as long as possible because it will lead to high performance. This is simply because if a request comes in for that page, it can be read from the cache rather than searching on the disk and ultimately reduce I/O. As for the expected value, this is a tricky one. You’ll probably read online that it should be more than 300. This is an old rule, when SQL Server memory could maximum be 4 GB. These days, we can have much more RAM than that and this metric is basically memory dependent. Therefore, one of the most known memory formulas that can be found to calculate your PLE value online is the amount of allocated memory to SQL Server divide by 4 and multiply that number with 300. For example, if 16 GB is allocated to SQL Server it should look like this 300 * (16/4) = 1.200. So, this number is your base and if our PLE value is below this number that would be a good indication that SQL Server does not have enough memory to keep pages in the buffer long enough. By the way, this will directly affect buffer cache hit ratio. Therefore, those two are the most important SQL Server monitoring tools and commonly used counters to discover memory pressures. For more information about monitoring two types of counters above, see the SQL Server memory performance metrics – Part 4 – Buffer Cache Hit Ratio and Page Life Expectancy article. SQLServer:Buffer Manager/Lazy writes/sec – this number represents how many pages are flushed from memory outside of the checkpoint process when there’s memory pressure. This value should always be < 20, if it’s greater then you should probably consider allocating more memory to SQL Server. For more information about monitoring this type of counter, see the SQL Server memory performance metrics – Part 5 – understanding Lazy Writes, Free List Stalls/sec, and Memory Grants Pending article. Now, if I would just start this data collection set, nothing unusual would have happened on my local machine. On idle, the result would have been perfect. So, let’s create some heat by running the SQL Server monitoring tool shipped within SQL Server called SQLIOSim. Again, I’m going to use the same stress test in which I’ve already pre-configured everything. If needed, jump to part one for details on how to do it. If the number of maximum amounts of memory that SQL Server will use is 2147483647 that indicates SQL Server will use as much memory as it can get, assuming it needs it. This is also the default value for max server memory (MB). So, back to the report, we’ve got almost 5 gigs od available RAM. More importantly, under the buffer manager counters, we have Buffer cache hit ratio at almost 100 percent. Now, this is as good as it gets, remember that we want a high value here. Lazy writer a second at zero are even better. Last but not least, Page life expectancy value is way above the base for this system which is really good. This means that pages are not getting flushed out of the memory because memory is not getting turned over. 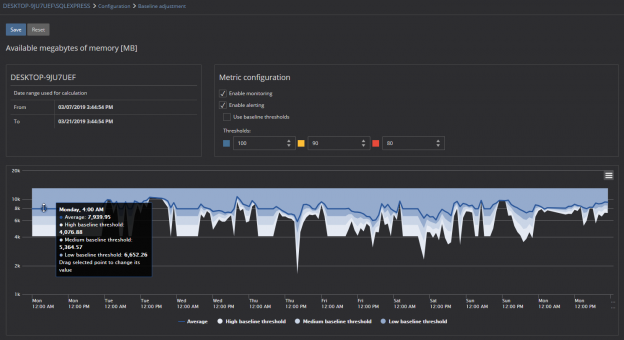 These counters are absolutely what you need in a SQL Server monitoring tool and what you want to look at when troubleshooting memory issues because they give us a lot of insight into how SQL Server is using memory. Let’s look at another SQL Server monitoring tool called ApexSQL Monitor and see how it can be used to track available SQL Server memory. One of the most useful features of this tool is reports because they can help us with the analysis of historical SQL Server performance data. The application has predefined reports divided into different categories but for the purpose of this article, we can create a new custom report in a few easy steps. Furthermore, these metrics are also set, by default, to notify you about potential and ongoing performance issues with your machines. Alerts are also configurable on a granular level for each monitored machine. We will continue the SQL Server monitoring tools story in another article in which we will talk about CPU pressure slowing down the database server.